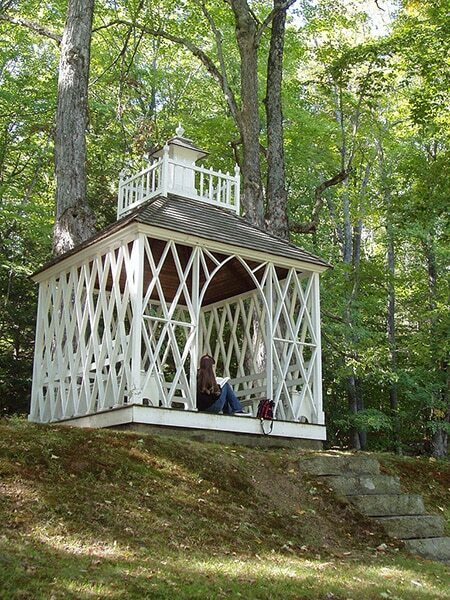 Many see the idea of a gazebo as a window into the past, when a separate space was needed for courting while still being chaperoned. The quaint charm of an outdoor room can still add character to a backyard space, especially if you have a large yard or a garden. 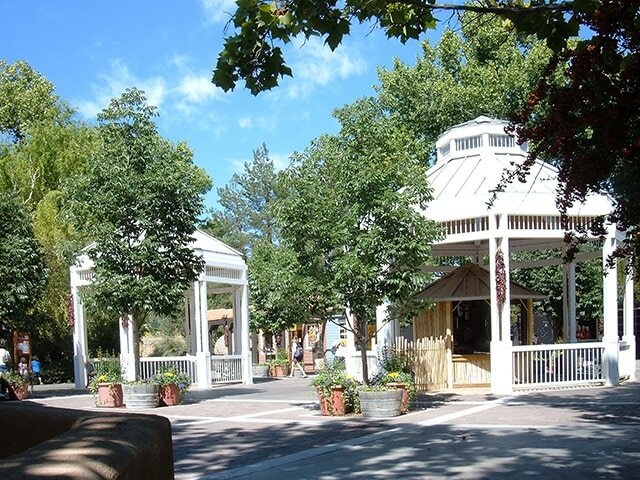 But consider new options available to update the style of your outdoor gazebo. Don’t settle for the traditional appearance. 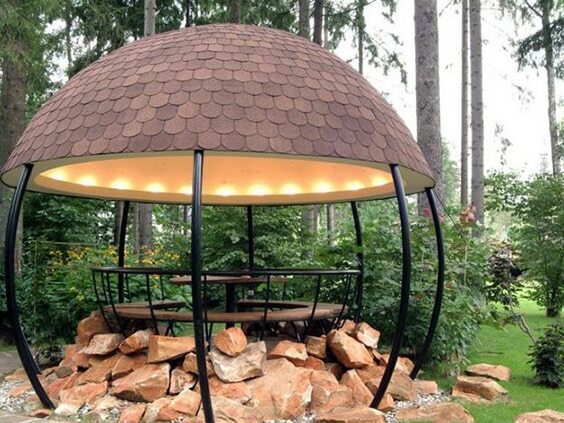 Take a look at some of the most wicked designs for outdoor spaces and ideas that can lead to inspiration for your unique incorporation of a non-traditional gazebo in your yard! 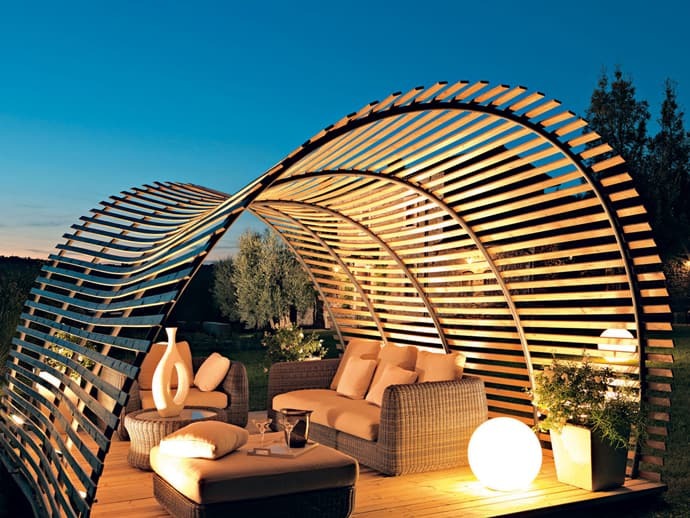 You don’t even have to use your imagination or get your hands dirty to incorporate a gazebo or modern pergola into your outdoor space these days. prefabricated designs are already assembled for ease of installation, and you can peruse the variety of classic and contemporary styles to find one that suits your purposes. Consider a spectrum of materials and styles available for the job. If you’re handy enough with the hammer and can read blueprints, try your hand at building your own. There are plenty of designs out there for free, and all you have to do is gather the right materials and put your carpenter’s hat on. Not good with construction? Commission the job, and even add your own custom ideas so you get the exact look and feel, allowing you to feel at home in your gazebo. Some of the most important decisions in designing your backyard gazebo come before the actual shape and look of the structure. The location and size of this garden or outdoor feature are vital to the overall design. Garden gazebos can be placed as an entrance or passageway to the garden, while outdoor rooms can be just a few steps from your back patio. And depending on how big your yard is, you may need to adjust the size of your gazebo accordingly. 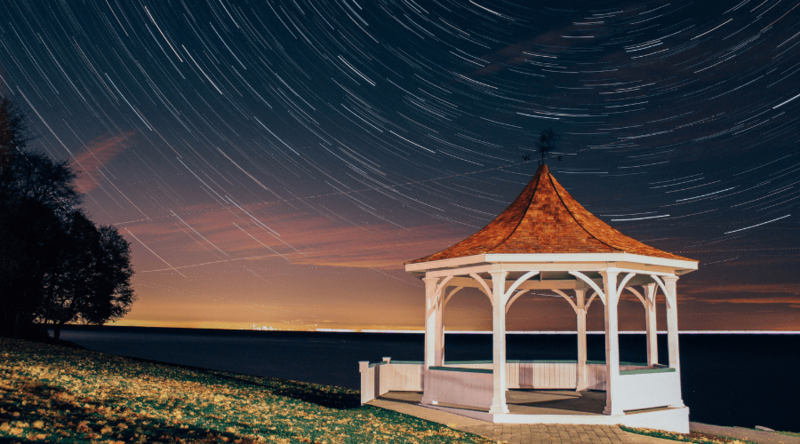 Creating your own gazebo from scratch is a big undertaking, but if you’re up to the task, take a look at the step by step process. This is a complete description of a project undertaken by another do-it-yourself carpenter, detailing the difficulties and necessities to get the job done. It’s a great source of ideas, warnings, and wins for self designers. Pergolas are more open than gazebos and can work better in small spaces. 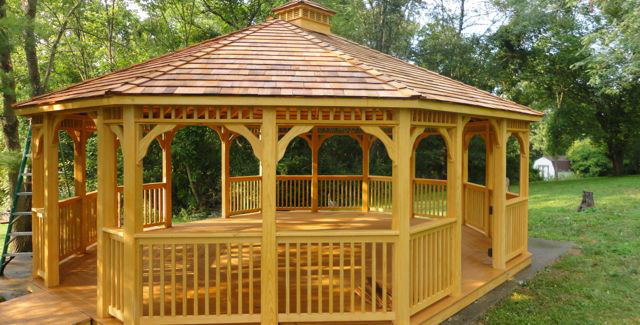 Of course, you don’t have to stick to the traditional octagon gazebo or square pergola when designing your outdoor space. Whatever seems unique and appealing to you can work. This is the new tradition in creating a modern feel while incorporating a classic idea into your yard space. Even if you keep a traditional shape to your pergola or gazebo, you can update the appearance to reflect your personality. Keep the raw wood look, or use a lacework style with the wood to add texture to your design. And be sure to outfit your outdoor space with furniture that appeals to you. 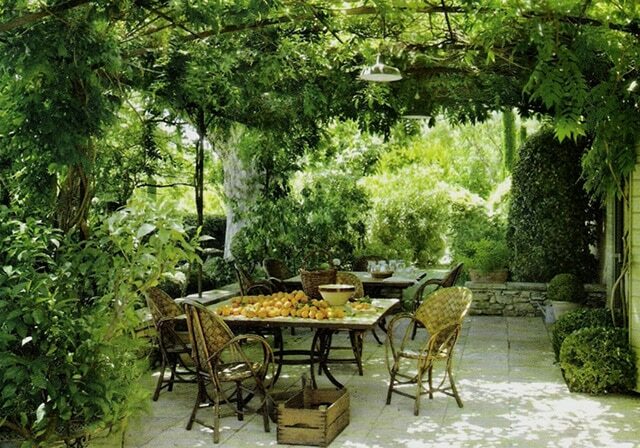 A nice picnic-style set of table and chairs can become an outdoor haven when arranged to your liking. Dream of living on a quiet island retreat? 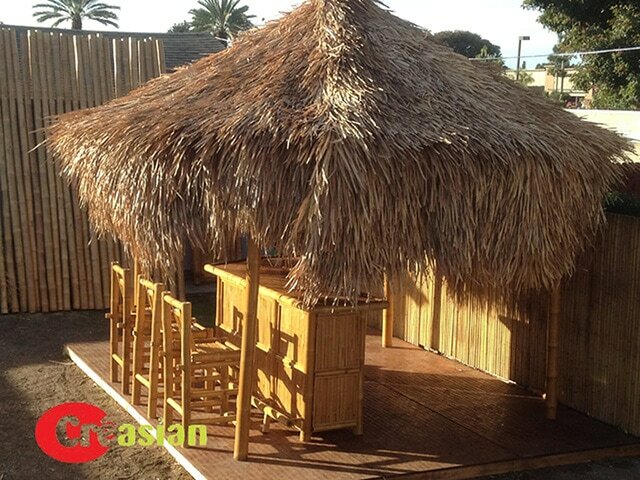 Create your own by commissioning a tiki hut style gazebo for your backyard space. 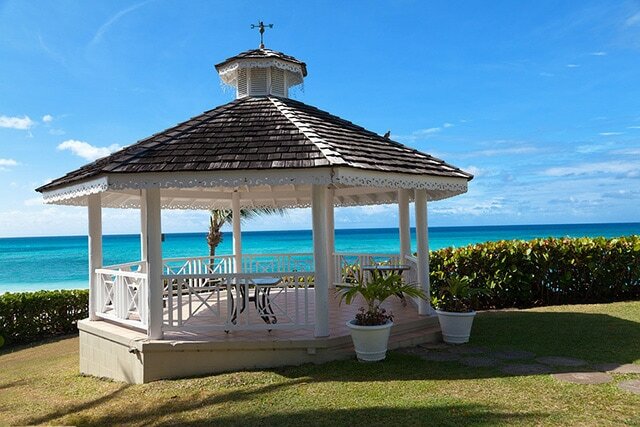 Mimic the thatched gazebo roof with textured layers of wood, and outfit with minimalistic furnishings low to the ground to get that beach feel. Every time you step out your back door, you’ll find yourself going on a vacation. A taste of the Orient doesn’t just come on a plate garnished with sprouts and doused with soy sauce. If you love the intrigue and architecture of all things Asian, bring it home to your big or small backyard. 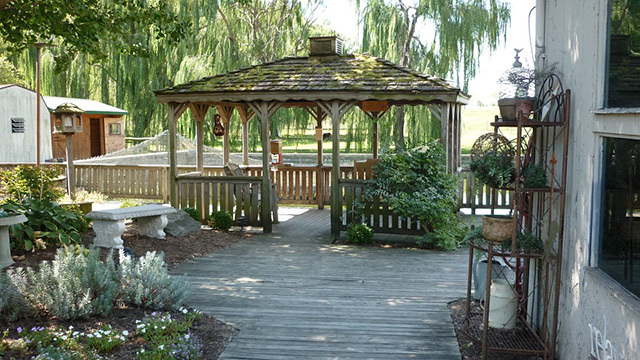 Small design elements can add a lot of character and pizzazz to your pergola or gazebo. Create a Japanese temple in your outdoor space, and worship the earth and its many wonders! Your freestanding outdoor space doesn’t have to ‘stand out’. 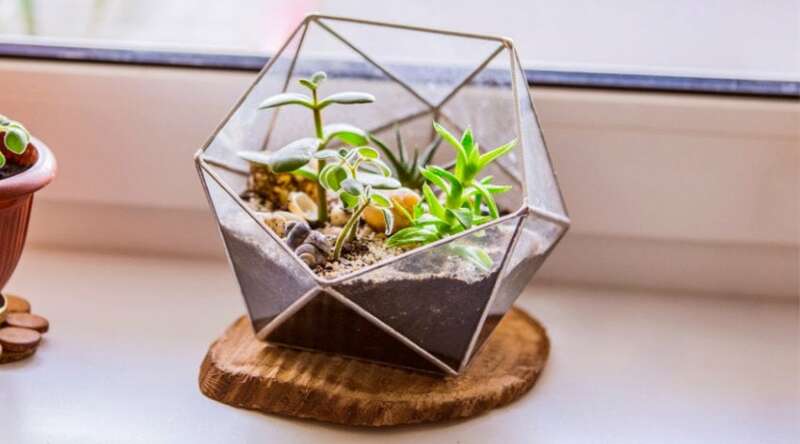 It can be incorporated into nature with a little creative design. 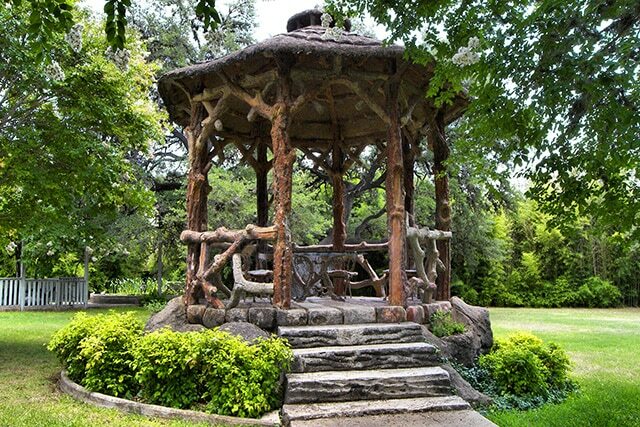 If your yard is backed by trees, make them part of the structure by extending the leafy canopy across to create the canopy of your gazebo. Let nature continue to rule while also nesting into your own little space to relax. Just because you’ve chosen to spend time outdoors doesn’t mean you can’t have your creature comforts, either. With the right materials, you can build an open air room right in your yard. Soft couches, pillows, and blankets can really warm up the space and add a splash of color to a wood design so you feel right at home, in the midst of the birds and the bees and the trees. If the climate around you makes it difficult to be in a completely open space due to excess sun or wind, try a design that incorporates a single wall and a completely covered roof. Face the wall in the direction of the harshest sun or most common wind direction to help conceal your space from the elements. This doesn’t mean your gazebo or pergola has to feel sheltered – add light, wicker furniture to help remind you that you’re still in a natural setting. Of course, an awesome DIY fence wouldn’t be a bad idea, either. 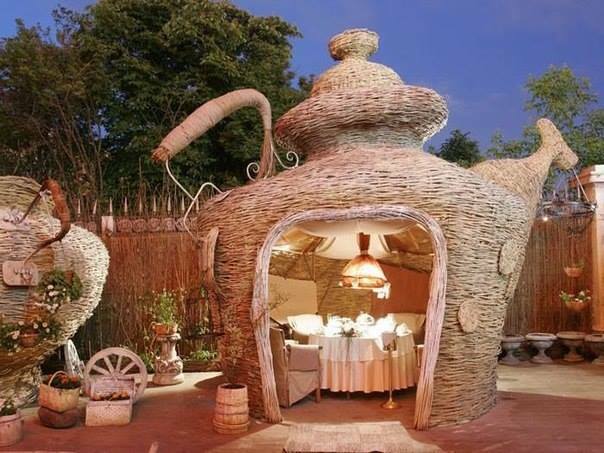 Enjoy your afternoon tea outside – in a teapot-shaped gazebo! This design is fab, and you can create a similar space or one that holds even more meaning for you. 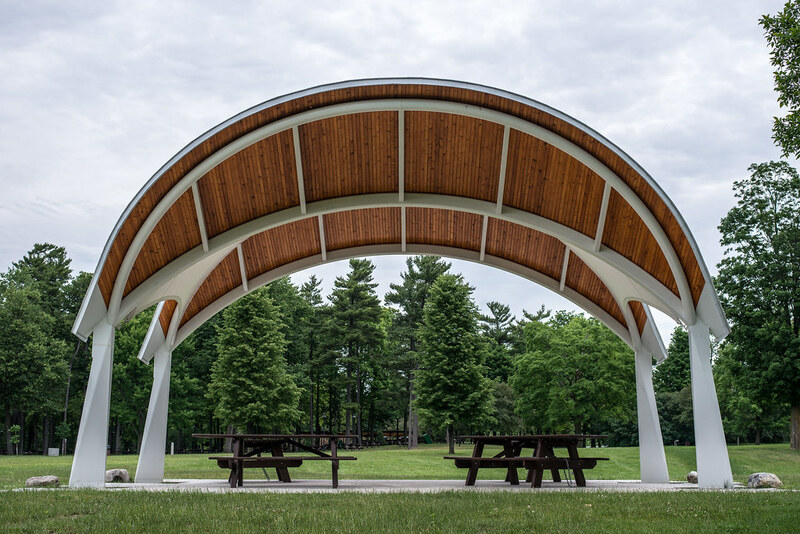 Think of a place that really inspires you, and consider the possibility of recreating it or paying homage to it through the construction of your gazebo. Don’t fit yourself into the mould of the past – create your own to bring the present into your yard. Consider using your gazebo or pergola as a shelter for a hot tub or spa. 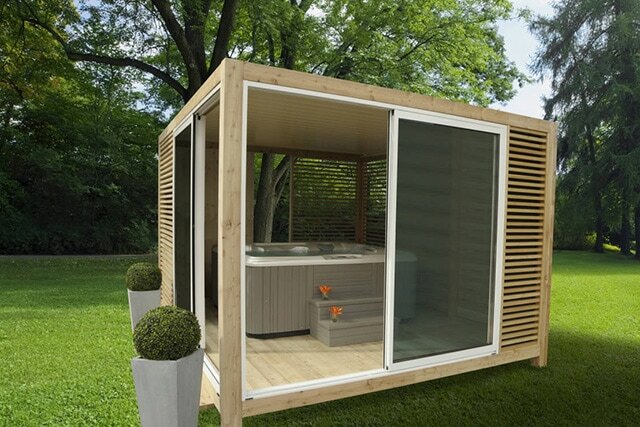 If you aren’t concerned with some epic design, it can be a simple box shape that makes the hot tub a viable option, regardless of weather. Have you ever been in a hot tub during a snowstorm? It’s the best time! 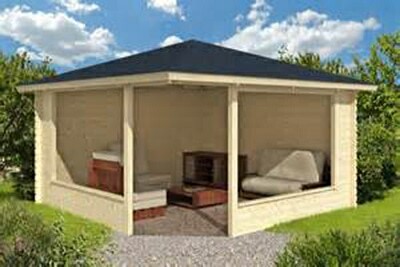 And with the right gazebo or other outdoor space, it’s easy to accomplish. Take blending into the environment a step further. Don’t just extend your tree canopy to the roof of your outdoor space. Bring nature inside with stone fixtures, plants, and other elements that really allow you to get the full outdoor experience without being exposed to too much sun or rain. This can be the revitalization you need when you escape to your outdoor space. Sometimes, less is more. Build a meditation space with clean lines and right angles that is inspired! You don’t have to trade comfort for design, though. The use of pillows and cushions can warm up the space just enough to give it a warm, appealing and welcoming nature. This is an especially stark and notable design in a large, open area, such as acreage in your backyard. 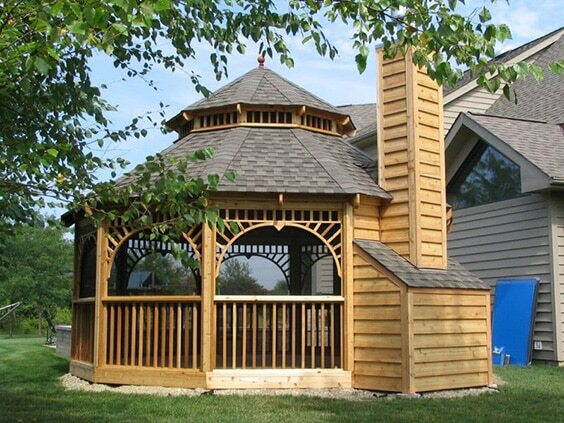 Your gazebo and pergola designs don’t have to be built on the ground. The popularity of the wooden deck addition to a home can call for an opportunity to design a beautiful overhang. Add elements like scalloping to give texture and appeal to the ceiling, or use fabric to create an awning that brings color and brightness to the look. Even Alice didn’t have a mushroom canopy under which to enjoy the Mad Hatter’s tea party. But you can! Consider whimsical delights or futuristic designs when deciding what would suit you best for your yard. The sky is the limit when it comes to creating a look and feel that reflects your personality and the way you relate to nature! Do you have a lot of space in your yard? Are you intrigued by new age industrial elements of architecture? 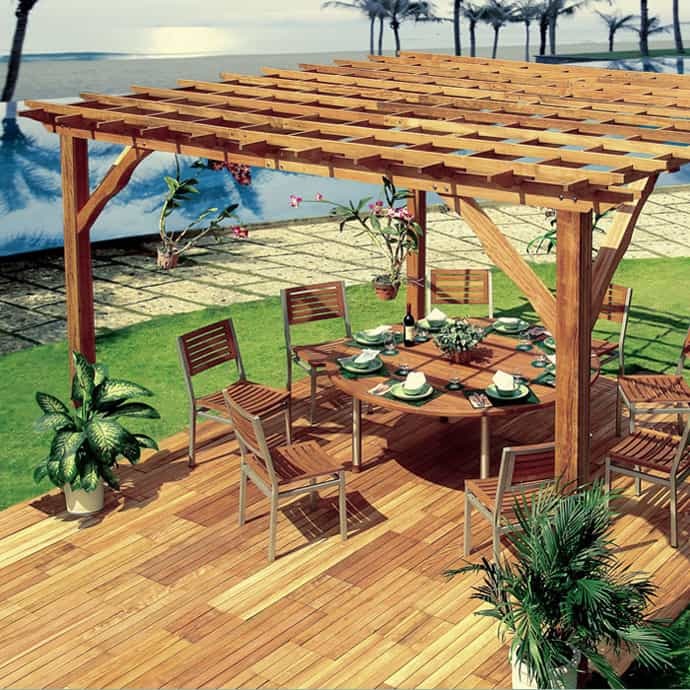 Make your gazebo or pergola more than a functional building. Make it a work of art that reflects your taste in modernism and contemporary pizzazz. The bright white here really adds a contrast to the surrounding multicoloured beauty, making it a structure that really calls attention to itself. Try using materials that create a clean, elemental atmosphere. Bamboo is light and airy but strong, and it gives a sleek, modern feel to even the most traditional design. Teak furniture built in a minimalist fashion can speak volumes about your peace and your alignment with nature. Blend the two and create a haven, like an inner sanctum brought outdoors. 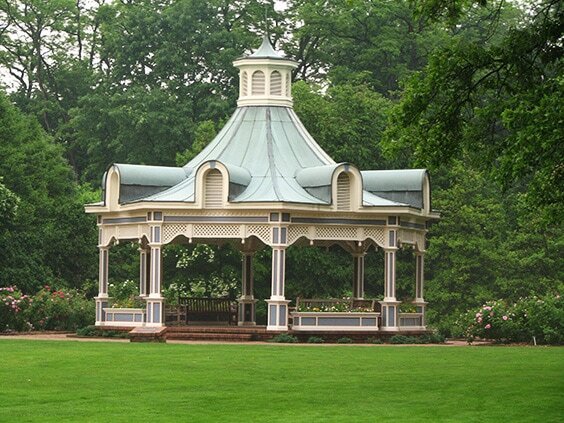 If you prefer a traditional look, consider updating it slightly to make your gazebo a viable outdoor space year round. A chimney with a working fireplace can really create warmth that lasts so you can step out into nature any time of the year, and the design gives it a bit of a wow factor over the original octagon that most people would expect in a classic rendition of the space. 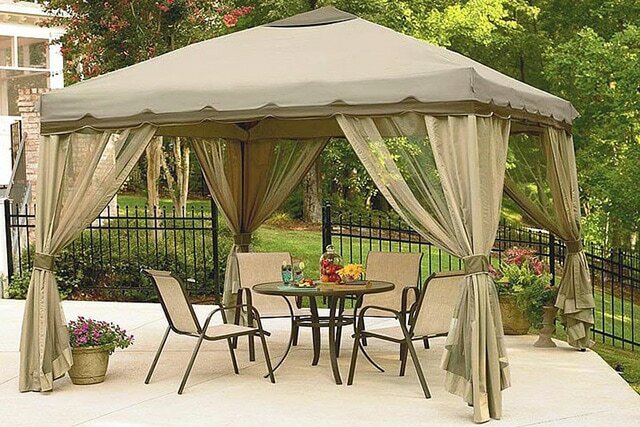 Don’t forget that your gazebo is likely somewhere you’ll want to entertain, be it your own family or visiting friends. Keep it cozy and friendly with built in bench seating all the way around, making it easy to fit everyone and to make eye contact across the centerpiece. To soften things up, add a colourful cushion to the seats. You can even change up the look seasonally! We all love the architectural buttresses and the chilling inspiration of gothic structures like Notre Dame. 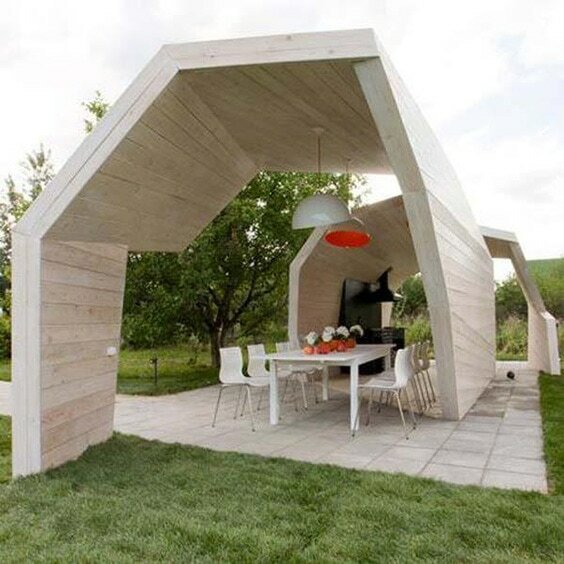 Why not incorporate something as epic as this in your own, smaller outdoor space? It will certainly be intriguing enough to become a conversation piece all its own, and it will likely be the most unique garden addition in your neighbourhood! 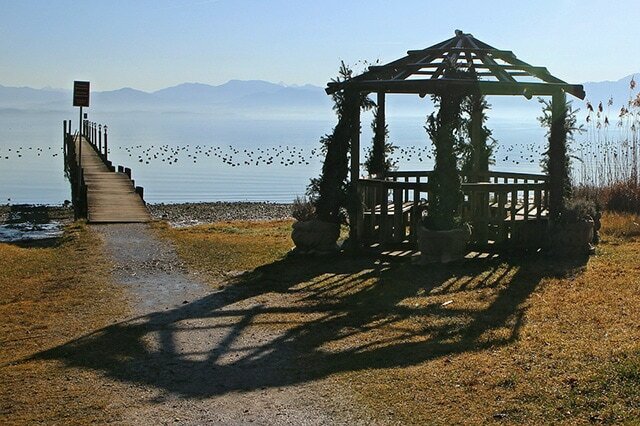 Your choice of gazebo or pergola doesn’t have to be ultra-modern. Just because it’s considered a style of the past doesn’t mean you can’t incorporate something classical into your landscape. 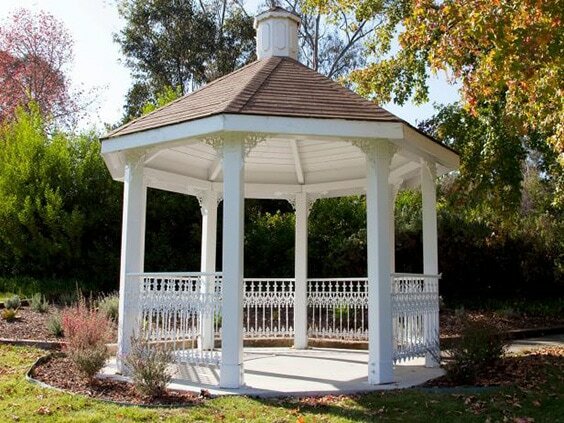 If you so desire, build a traditional octagon shaped gazebo, and add a beautiful whitewash to it for a beautiful addition to your garden or other yard space. You see this sort of design in tons of parks across the country, and it’s a great idea for your own backyard design. 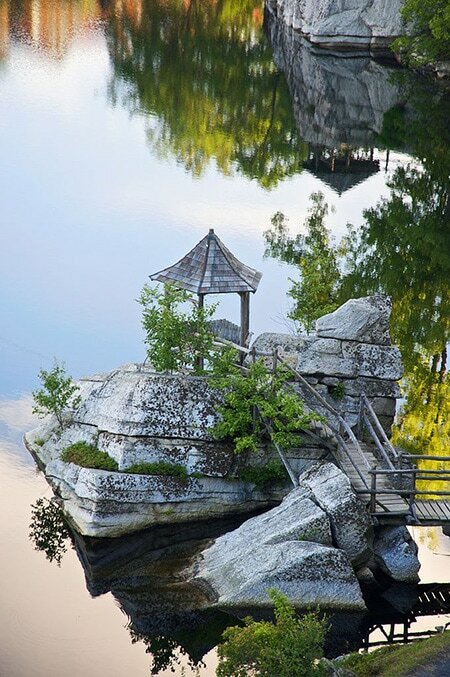 whether you have an existing pond or want to build one, you can have a raised gazebo be part of a small bridge passing over the water. You’ll find the time you spend in it incredibly relaxing, the trickle of water beneath you bringing a peaceful ambiance to the space. 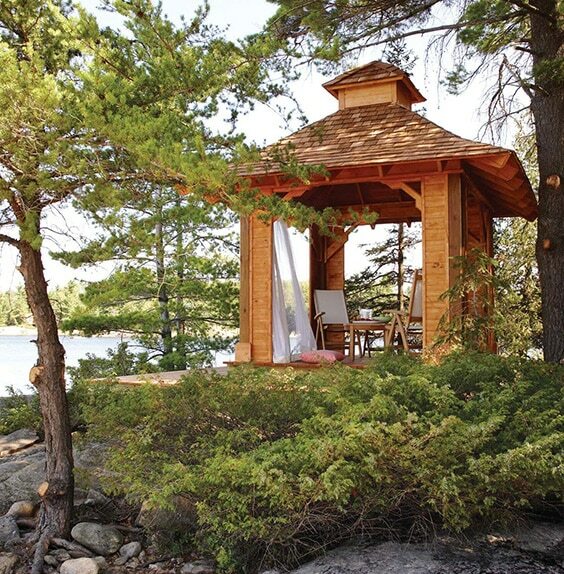 If you’re putting together an oasis, don’t stop with the tiki hut style structure that mimics the gazebo’s intent. 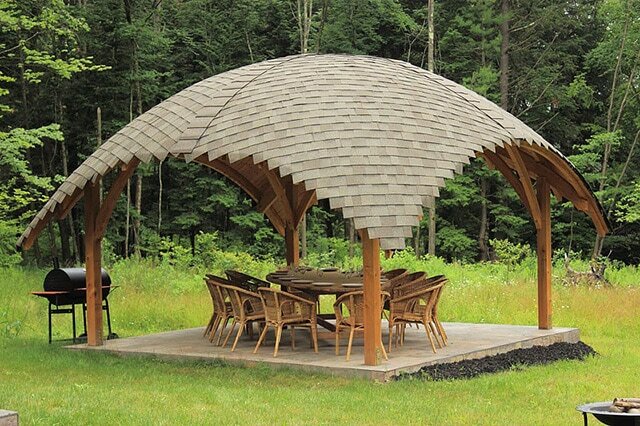 Make it useful in more than one way, housing a bar or small outdoor kitchen under the shade. Is there a better way to get that true island feel than with a fruity cocktail under a grass roof with a pretty little umbrella in the drink for garnish? I think not! 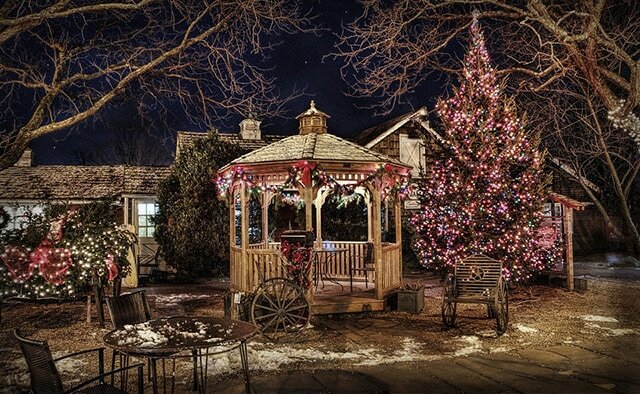 Whatever design you choose, make sure you incorporate your pergola or gazebo into your decorations throughout the year. Stringing lights for Christmas gives it a festive glow, and it’s a great spot to hide a thrill for Halloween, if you have a ‘haunted yard’. Add a flag or two for Independence Day and fall colors for Thanksgiving. 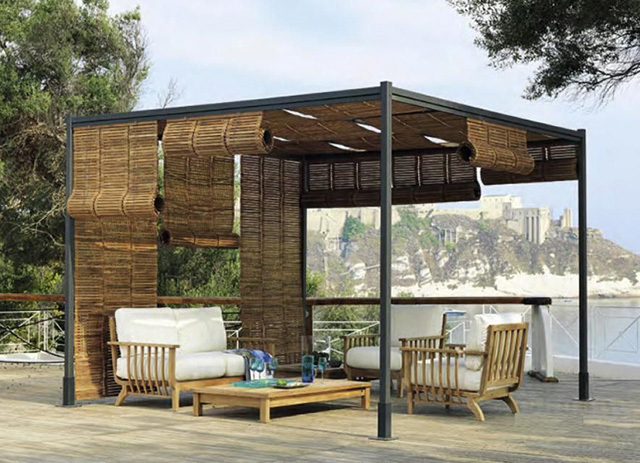 Blend two styles, using a space age design that is created with a canopy that mimics the look of a giant palm frond. The dual design offers cover during the heat of the day when the sun is at its highest and a haven from the rain while still being open and standing out as a high design creation. 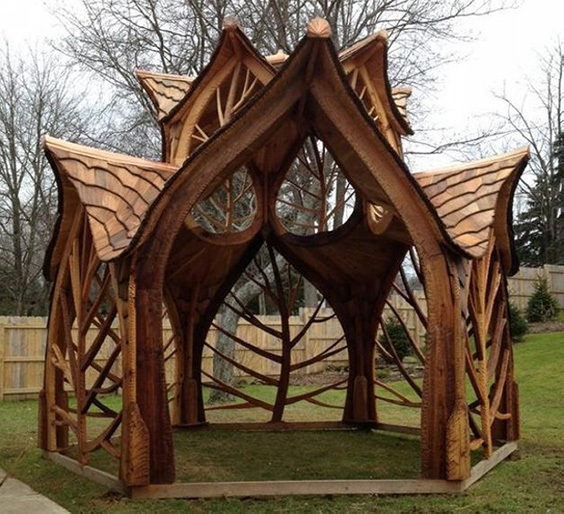 While the material and feel of this particular gazebo is fairly traditional, the shape is not. Keep classical elements, such as the beautiful columns or a latticed roof, while making updates that work well in your space and give it your personalized touch. It’s especially nice in a small yard space to adjust the size and shape of your gazebo so it doesn’t overtake the landscape. Take a look at the creativity pictured here, with multiple levels to the gazebo. 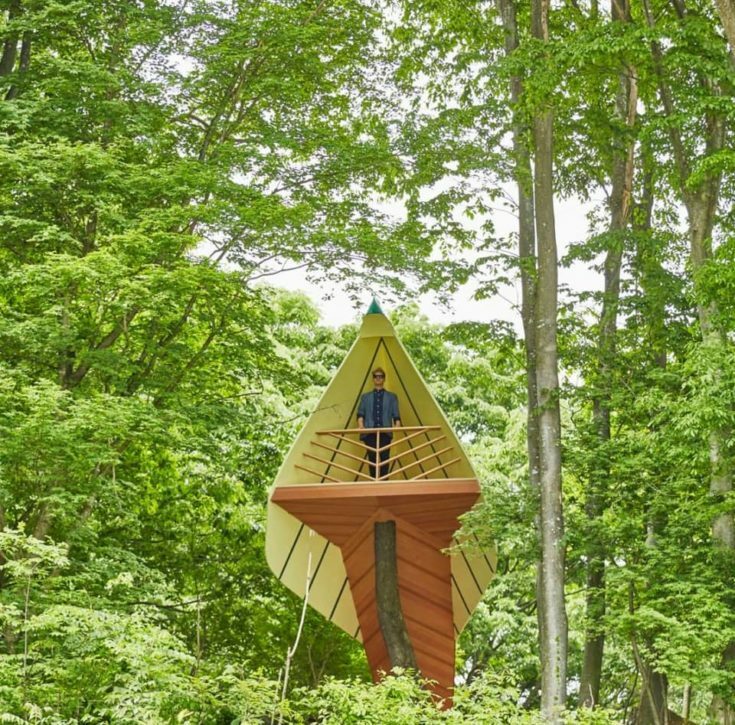 You can create a structure that looks something like a birdhouse and actually provide a ladder or other means of climbing inside so that you can stand high and get a true bird’s eye view of your land and its surroundings. You just need to reinforce the roof so it can hold your weight. 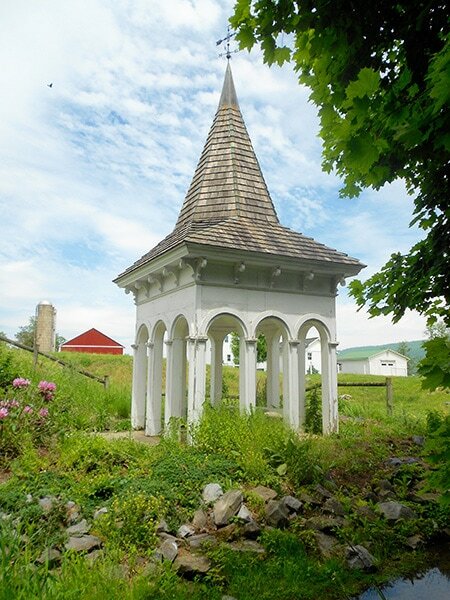 If you’re just looking for a way to dress up the entrance to your garden or even add drama to the path leading to your pool, try a tall, narrow circular gazebo that’s more of a passageway than a place to sit and enjoy the scenery. 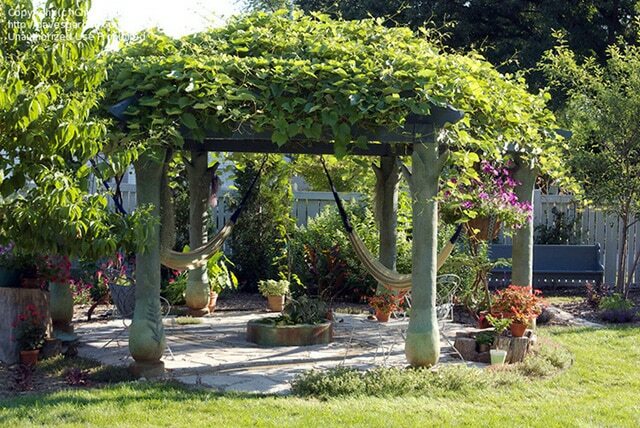 In this way, it’s similar to a pergola, more of a grand welcome than a relaxing haven. Add a little mystery to your design by incorporating the sorts of vegetation that makes it look like it’s been there for ages, untouched. 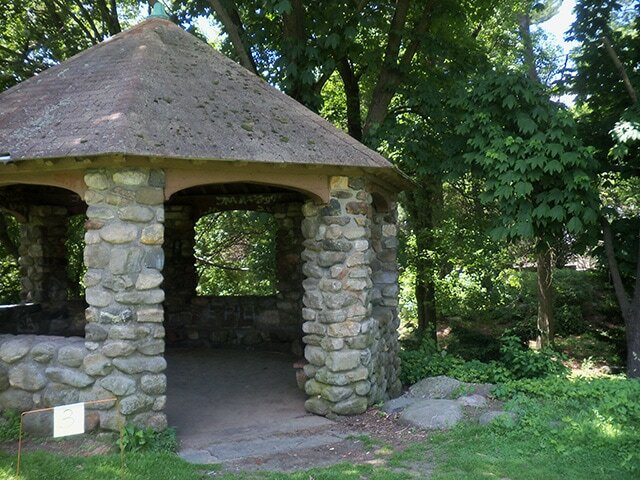 Ferns, ivy, and moss can all create a sense of overgrowth, as if the gazebo is older than the rest of the property. It’ll look like something right out of the past and be a source for conversation with your neighbours. 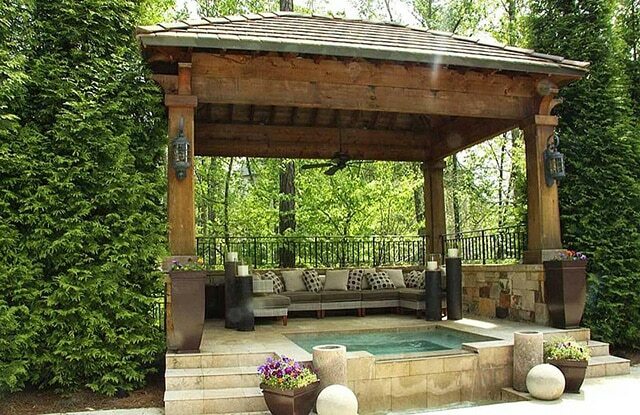 Just because you have a small yard doesn’t mean you can’t enjoy the beauty of a gazebo in your space. 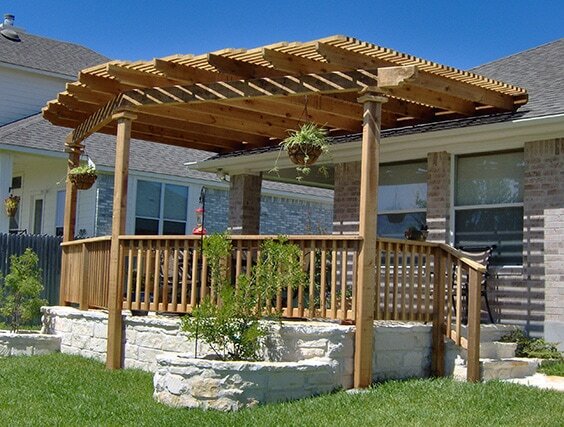 If you have a deck, you can build your gazebo right into it or on it, which leaves more natural space for gardening and offers you shading and cover for part of your deck space. Get year round use of the deck with this find addition. Mock windows give this gazebo a different shape and feel, but they also create a breezeway that keeps the interior of the space cooler during the hot summer months. The elevated vents catch even the lightest breeze and course it through the gazebo so you can really take advantage of the summertime and be outdoors in comfort. 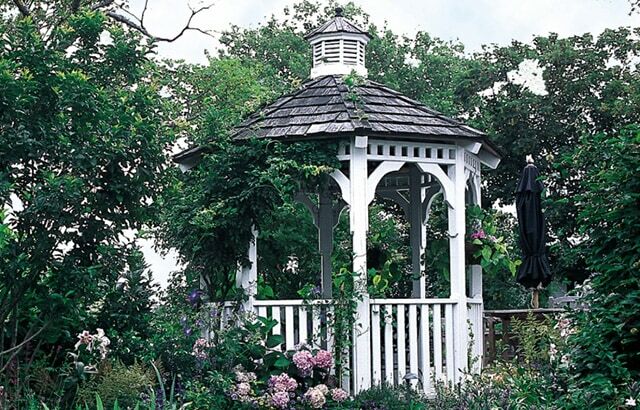 Varying the texture of your gazebo materials can give it added character. This stately structure is a combination of rough brick around the bottom, dressing it up with texture, and smooth columns painted a brilliant white for a stark contrast. The end result is a unique design that captures attention and demands respect without being overbearing or needing to take up too much space to get noticed. 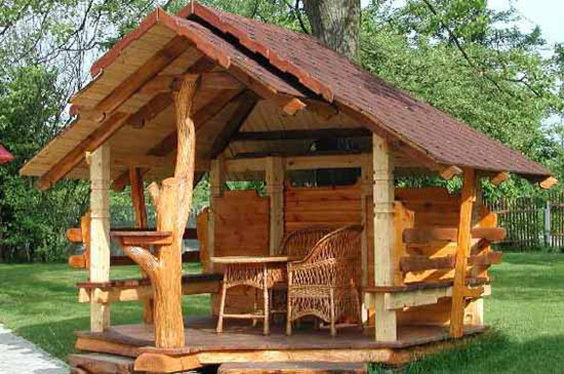 Rustic style appeals to many, so why not stick to the basics of your taste when creating a backyard gazebo design? Thick wood logs built out like a log cabin create the feel of being out in the woods, mimicking the solitude found in such places. You’ll enjoy the quiet, rustic design that keeps you connected to nature without the interruption of the day to day world around you. There’s something to be said for the awe inspiring stone castles in England, Ireland, and Scotland. Bring that ostentatious style home and create your own Medieval stone fortress, opting for a gazebo unlike anything in your neighbourhood. This is especially creative and appealing if you have several trees, making it seem like an abandoned castle ruins that you’re just itching to explore over and over again. 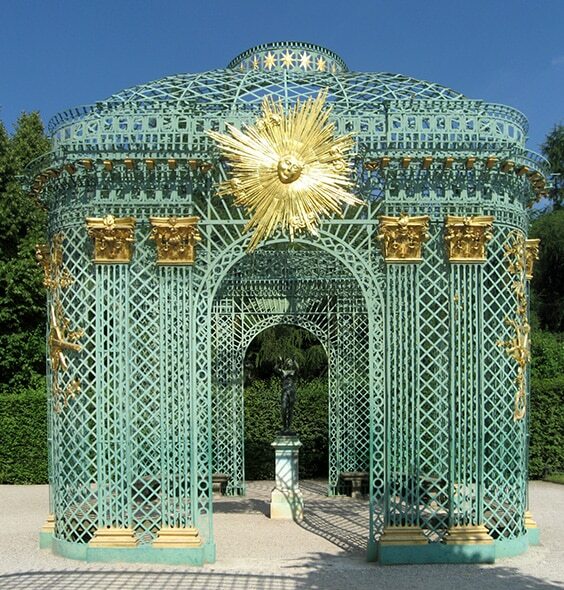 Trellises are made of detailed latticework, and so are many very basic pergolas. 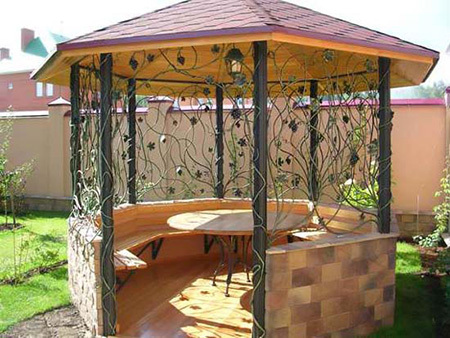 But few consider the option of building an entire gazebo with this sort of design. it can be very eye catching, especially if you paint it a brilliant color, and its openness keeps you from feeling isolated inside when you want to be distant but not disconnected! Celebrate the Chinese New Year all the time with a beautiful, Asian inspired retreat. 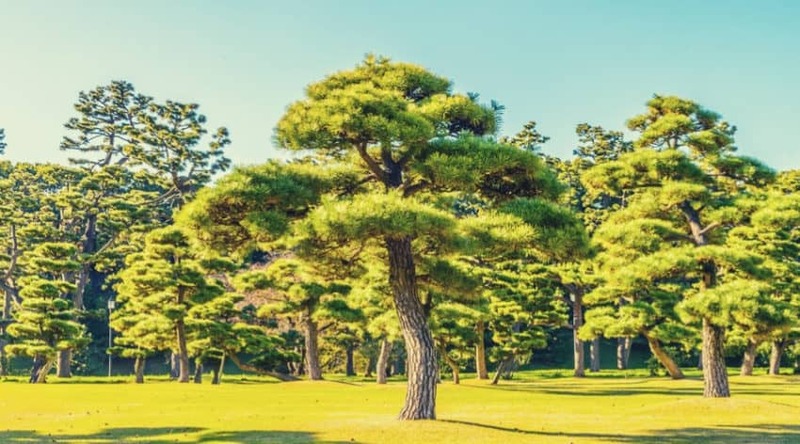 Especially if you have an herb garden or intend to specialize in plants from the Orient, this can be a great addition to your backyard design. And the stark colors in contrast to the surrounding greenery can really be inspirational and invigorating to you and anyone else who can see it. 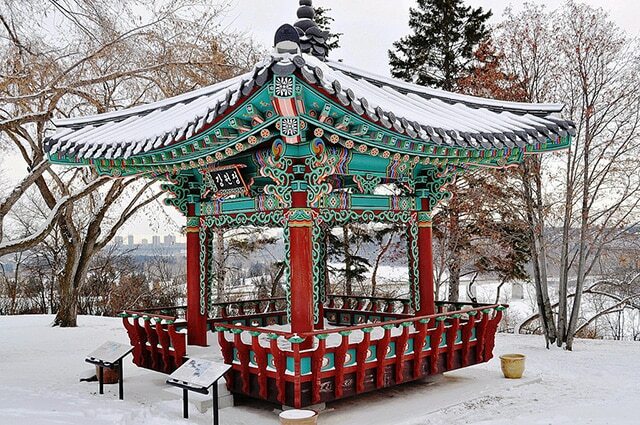 Here, the design is quite simple, and the gazebo itself is small, like a pass through to a garden path. However, the suggestion of perhaps a place of worship gives it an ethereal and almost reverent feel. 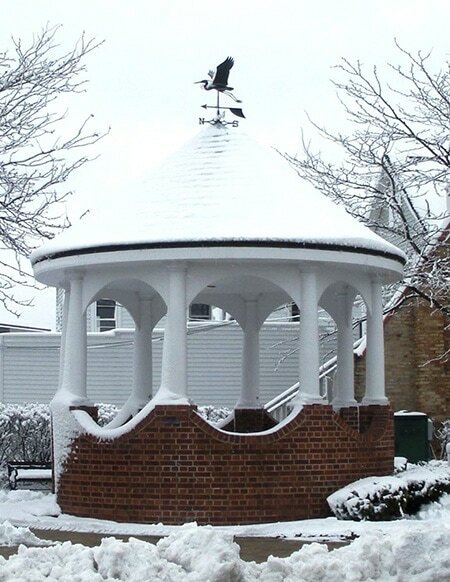 If you love the architecture of churches, temples, and other religious buildings, bring home some of the elements that most appeal to you and use them when designing your gazebo. 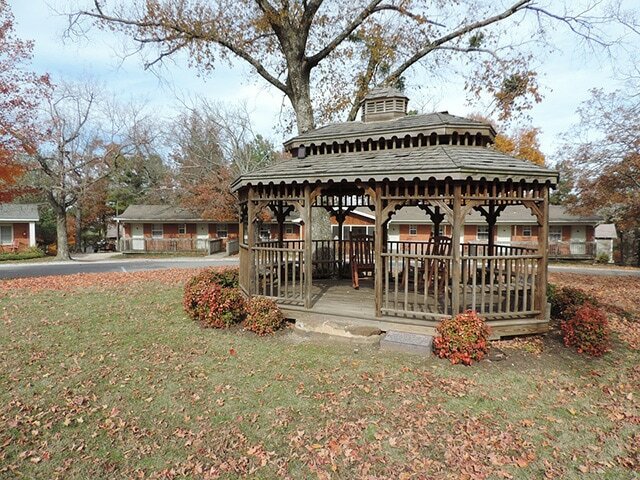 A gazebo doesn’t have to be a single structure. 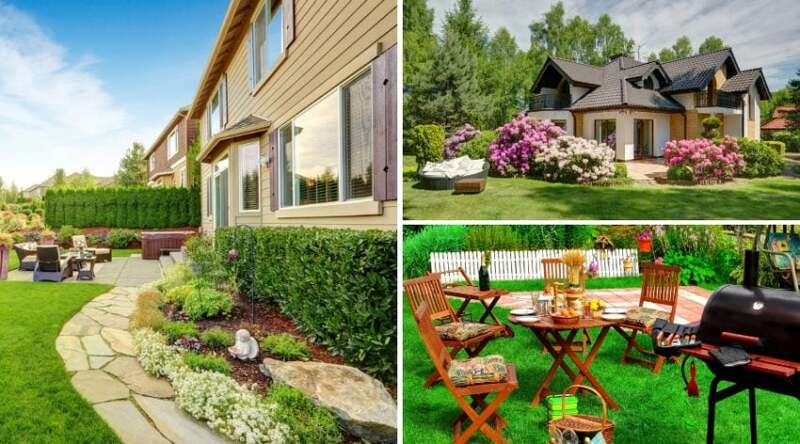 If you have more space in your backyard, consider multiple buildings for a variety of purposes, all different sizes. You can even have your doghouse or your pool supplies or tools housed in a separate structure under the larger of the two gazebos and use the other for seating. Here’s an idea that’s one for the record books. 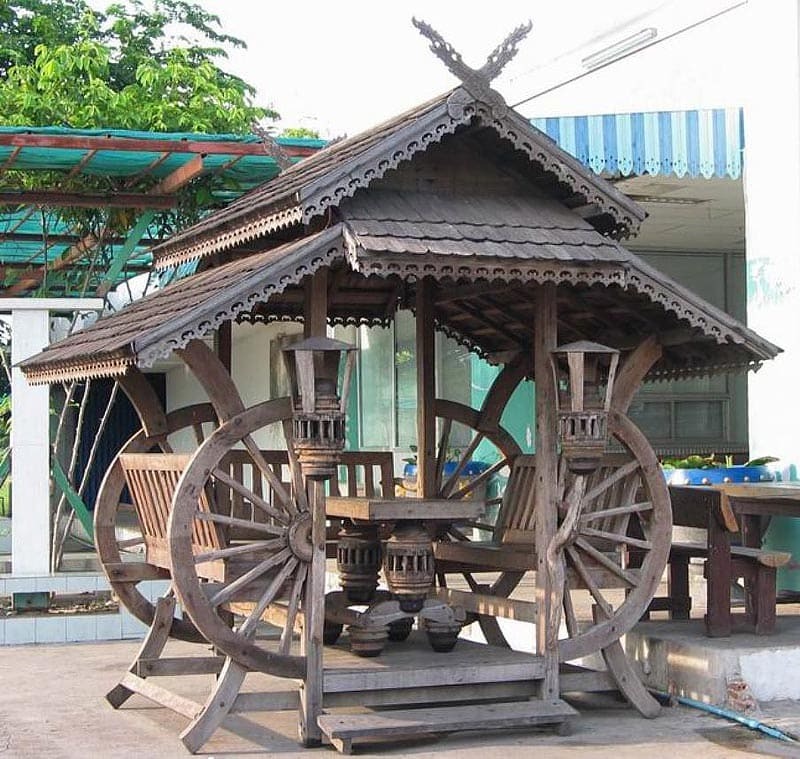 Rather than letting an old boat sitting in your yard go to waste or having another structure – even a wheelbarrow or part of an old vehicle – sit and rot, incorporate it into your backyard design by making it the base for your gazebo. It’ll definitely be the most unique structure for miles around, and if you post pictures of your creative endeavour, they will likely go viral! This goes back to an aspect of the religious structure. There’s a reason people visit the cathedrals in Spain and marvel at some of the simplest Christian churches. It’s because steeples and spires are awe inspiring. 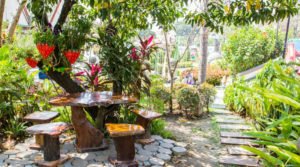 Bring that element of worship into your yard, and use it to create a space that resonates with you, inspiring peace and harmony with nature in your heart anytime you spend a little time outdoors. Don’t ignore a design element just because it has a stigma of being ‘old-fashioned’. 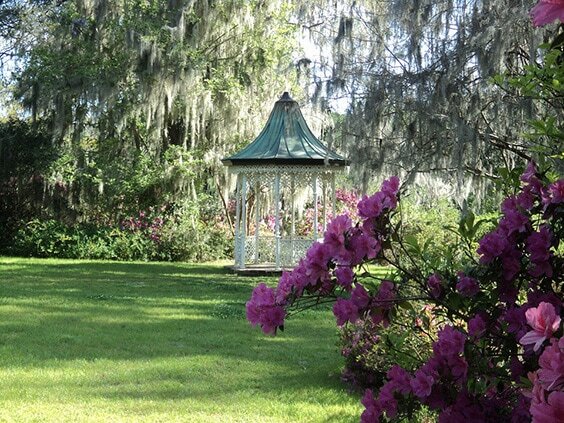 You are free to be as modern or as classic as you like, and when you add a gazebo to your yard, you get to create something that is meant to please you. It’s not for everyone else. If you love it, and you feel relaxed and at home in your outdoor space, then you can’t go wrong. But don’t feel stuck in the dark ages, either. Incorporate the elements you like into the design, and let your neighbours, friends, and family gaze upon it in awe! 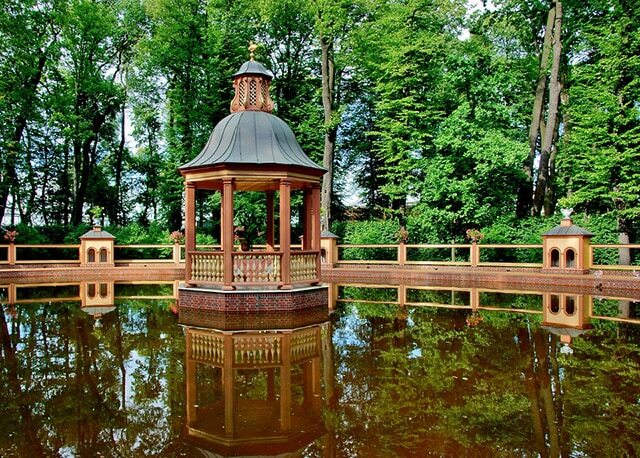 Did you love this eclectic round up of awesome gazebo designs? Did it inspire you to get out and get create in your own backyard? If so, leave us a comment below! Thanks for all the ideas. Lots of inspiration!!! Gave us lots of food for thought as we design our Dublin gazebo. 72 of the Best Bird Bath Ideas for Any Yard: #47 is Super Cool!